Meghalaya High Court Recruitment 2019: High Court of Meghalaya, Shillong / meghalayahighcourt.nic.in is conducting recruitment processes to fill 3 vacancies. As of now, there is one recruitment drive going on for Apply Online for District Judges Posts. Meghalaya High Court Recruitment 2019 - Apply Online for District Judges Posts in Meghalaya High Court, Shillong, Meghalaya on Direct Recruitment. 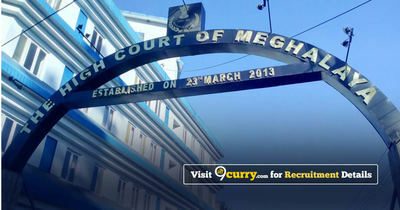 Online Applications are invited by High Court of Meghalaya, Shillong from 18 Apr 2019 01:00 PM to 30 Apr 2019 for 3 vacancies. Meghalaya High Court Recruitment 2018 - Job notification for District Judge Posts in Meghalaya High Court, Meghalaya on Direct Recruitment. Applications are invited by High Court of Meghalaya, Shillong on or before 17 Dec 2018 for 5 vacancies. Meghalaya High Court Recruitment 2018 - Apply Online for System Officer, Driver & Other Posts in Meghalaya High Court, Meghalaya, Shillong. Online Applications are invited by High Court of Meghalaya, Shillong from 01 Nov 2018 to 15 Nov 2018 til 05:00 PM for 8 vacancies. Meghalaya High Court Recruitment 2018 - Job notification for District Judges Posts in Meghalaya High Court, Shillong, Meghalaya on Direct Recruitment. Applications are invited by High Court of Meghalaya, Shillong on or before 26 Jul 2018 for 5 vacancies. Updated June 15, 2018 7:30pm by Dheeraj Singh Bìsht | Advt No: HCM.II/98/2015-Estt. Meghalaya High Court Recruitment 2018 - Job notification for Stenographer Posts in Meghalaya High Court, Shillong. Applications are invited by High Court of Meghalaya, Shillong on or before 15 Jun 2018 for 5 vacancies. Meghalaya High Court Recruitment 2017 - Job notification for Law Clerk Posts in Meghalaya. Applications are invited by High Court of Meghalaya, Shillong on or before 10 Nov 2017 for 4 vacancies.